I was contacted earlier today by a Magellan International investor lamenting their loss. I was aware Magellan International had stiffed investors when they exit-scammed from the US, but out of curiosity I headed over to the company’s website. In place of the Magellan International business website however is a “public notice”. 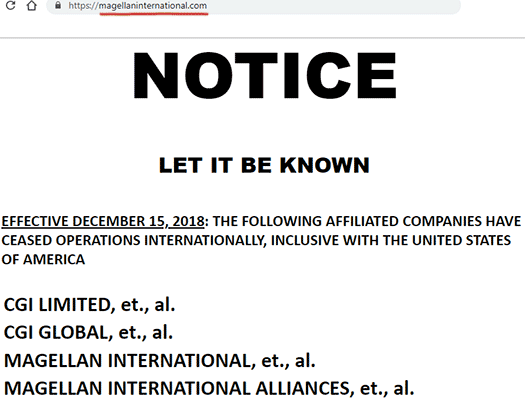 As above, the notice advises that as of December 15th, 2018, Magellan International has “ceased operations” globally. On the surface the Magellan International public notice’s presentation is presented to mimic that of a regulatory shutdown. The notice advises an anonymous “trustee” has been “contracted”, and will be ‘un-winding the operations in an orderly manner‘. If you were a representative (rep) or a member and you conducted business with any of these organizations, you may be entitled to a refund. If you believe that the amount of money in which you paid for your original product and or product package has not been returned to you, in the form of payouts, commission’s [sic] and or bonuses, the acting Trustee would like you to contact them directly. A big blue button is labelled “click here”, which redirects to “cgimagellanliquidationacct.org”. At the time of publication there’s nothing on that domain except a registration form for Magellan International affiliate investors. The liquidation domain itself was registered privately on January 3rd, 2019. Needless to say this is not how a government shutdown unfolds. Magellan International surfaced as CGI Limited in early 2018. BehindMLM’s review of CGI Limited uncovered a depraved business model that, among other things, allowed investors to bet on illegal cockfights. A few months after our review CGI Limited changed its name to CGI Global. Shortly after that CGI Global was shelved and a “new” business announced. Through Magellan International, CGI Limited victims were told they could “earn millions”. CGI Limited, CGI Global and Magellan International centered on betchip tokens, through which affiliates were able to derive a passive ROI through an internal exchange. The Magellan International name-change also coincided with the departure of CGI Global founders Lorence Irvine and Daniel Grenon; both cryptocurrency Ponzi scammers in their own right. How much Irvine and Grenon stole from CGI Limited investors before doing a runner is unknown. Jef Welch (right) stepped up to head Magellan International as CEO. Welch had previously worked behind the scenes on setting up CGI Limited’s financial channels. BehindMLM’s Magellan International review went live in August 2018. Despite having a CEO based in the US, the following month Magellan International announced it was abandoning its US operations. To the best of my knowledge the majority of US Magellan International affiliate investors, if not all, have simply had their money stolen. At the time of the US announcement, America was Magellan International’s primary source of new investment. Needless to say the decision tanked the business, resulting in a collapse on December 15th. Jef Welch is still very much active on social media. I traced his Facebook account back to December 15th and found no mention of Magellan International’s collapse. 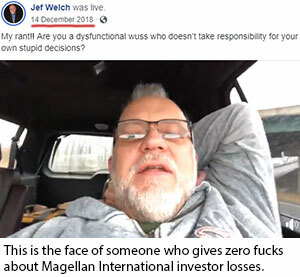 The day before Magellan International collapsed, Welch, stretched out and seemingly without a worry in the world, posted a fifteen minute video to Facebook. Four days before Magellan International collapsed, Welch featured in a puff-piece on Ted Nuyten’s BusinessForHome. Although I could see many strong intelligent leaders in direct sales migrating into the crypto currency companies, there has been a mountain of carnage at the expense of good people investing their time and money. I saw too many people getting hurt in the crypto deals. Once I became CEO, I determined that for Magellan to succeed, we could no longer take advice from leaders with track records of failed history in crypto-currency companies. Most companies are built around the feeding of the “money-game” where all their decisions are to stimulate the activity of momentum from the memberships. This might work for a few months but it cannot sustain. And let’s be honest! Most of these companies are not focused on the coin they are launching, the profitability of the mining or the operation of the company. They’re just set up to be a money-game. The top leaders make their money and 6 months later they close their doors and merge to the next deal. 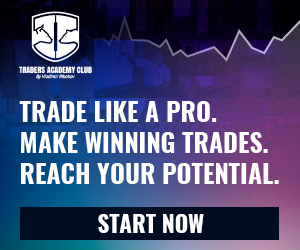 They usually don’t even see the coin they are promoting, go onto an exchange. They lose everything they put into it. Magellan has stood by the policy of doing business the correct way. Strategically the BetChip is in perfect timing with the current crypto-currency recessionary. 2019 will be an exciting year to experience for everyone with BetChip. My take on all of this? Call me cynical but the collapse of Magellan International is your standard MLM cryptocurrency exit-scam. Jef Welch and the gang have stashed most of the invested funds, and this Trustee ruse is just an attempt to sort of active Magellan International investors. It is likely the Magellan International affiliate database has been sold. By entering your details into the new liquidation website you’re confirming you’re still active. Ponzi schemes are a zero-sum game, those who register on the liquidation website are probably being added to a new list. People on that list will, at some point, likely be pitched on a new opportunity. And that new opportunity will be pitched as a way to make back what you lost in Magellan International. That’s what these “refunds” are going to be. Just a hunch mind but that’s what it looks like from here. Magellan International was a Ponzi scheme, you’re not supposed to be able to get your money out. You invested in yet another MLM cryptocurrency scam and now your money is gone. Sorry for your loss. Next story Viva Life Science Review: No retail focus since 1989?